Travel is one of those things that naturally gives rise to queries, concerns and doubts, so we're here to put your mind at ease. 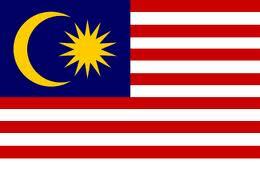 Request for transfer service by Borneo Eco Tours to/from Kota Kinabalu at an additional surcharge. 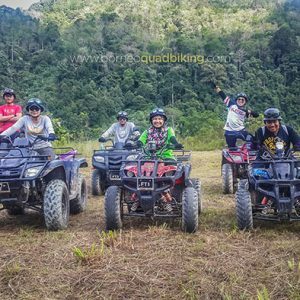 All adventurous activities including quad biking involve an element of risk. However, it is safe as long as you follow the full instructions and safety briefing given by our guides. 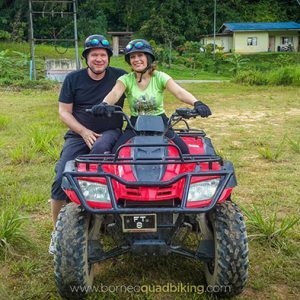 All tours are accompanied by one guide and sweeper, who will lead you through the tracks and will assist during riding. All participants are required to sign an indemnity form prior to riding. Yes. 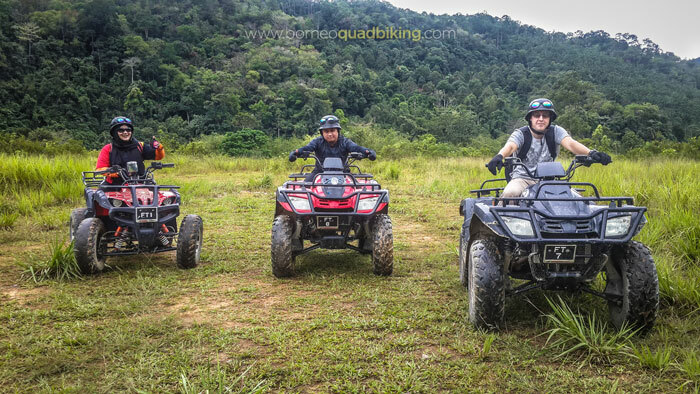 We highly recommend that you book ONE WEEK prior to departure due to the popularity of quad biking. A 100% payment in full is required to confirm your booking. What makes your tour different from other operators? 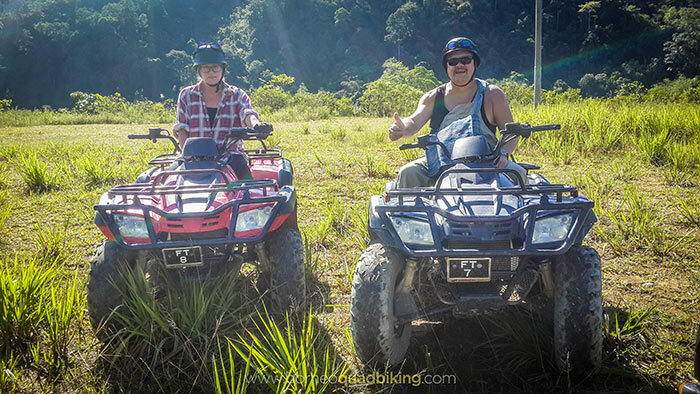 We are currently the only quad biking operator in the district of Kiulu. We are part of Kiulu Farmstay – a community based ecotourism project – which implements a social entrepreneurship approach that acts as a catalyst for community development and capacity building. 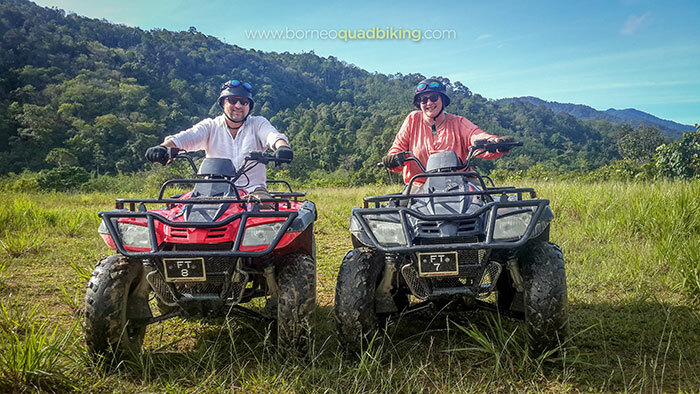 10% of every tour purchased will be contributed to the MUKEST (Mukim Ulu Kiulu Ecotourism Solutions and Technologies) Community Development Fund. We recommend that you wear long pants, comfortable clothing and trainers. For your safety, open-toe shoes and flip flops are not allowed. We’ll kit you out by providing helmets and gloves. 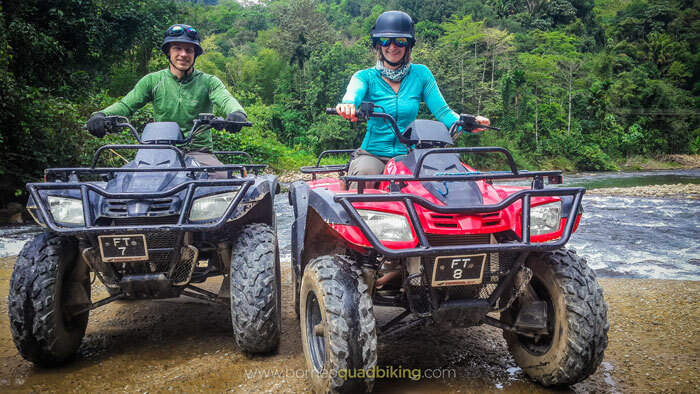 After a day out on our quadbikes, you will either be muddy, dusty or sweaty – so bring a change of clothing. A small backpack is best for carrying the essential items – sun block, sunglasses, hat, water bottle, personal medication, towel, and camera. Lastly, bring your excitement and adventurous spirit! How long was the ride last? 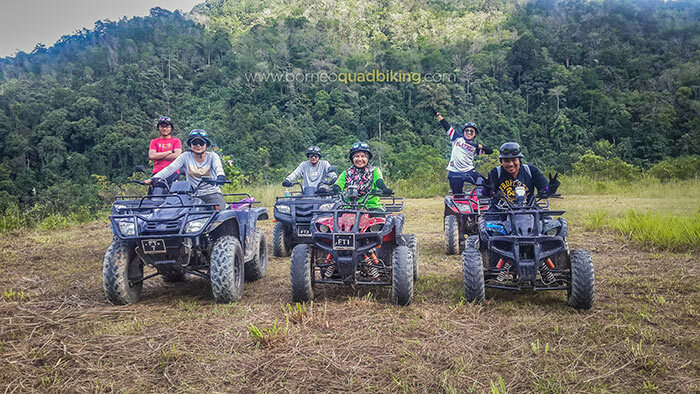 We offer THREE hours of fun and exhilarating quad biking adventure! This duration includes the safety briefing and practice run. Yes. There is river tubing, buffalo riding, hiking, indigenous sports, handicraft making amongst other things. 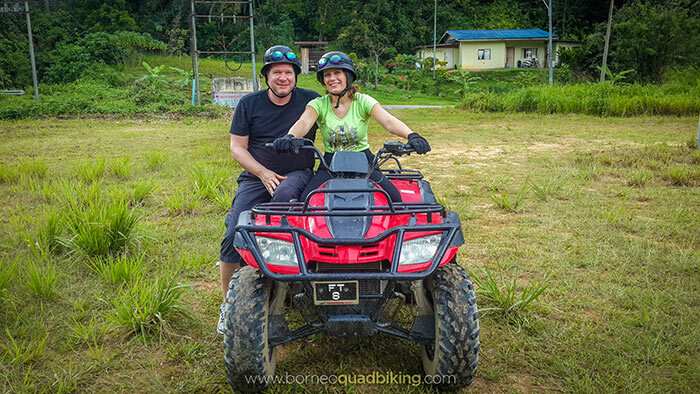 Please visit Kiulu Farmstay Things To Do page or email us at info@borneoquadbiking.com for more information. 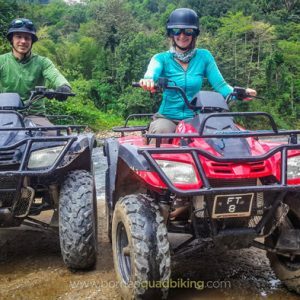 What time should I arrive for my quad biking tour? 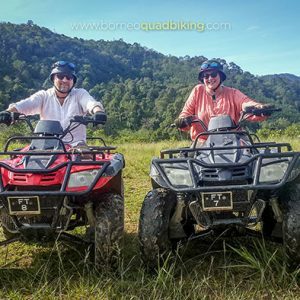 We ask that you arrive at least 15 minutes before your tour begins so that you have time to fill out the indemnity form and be fitted for quad bike, helmet and gloves. 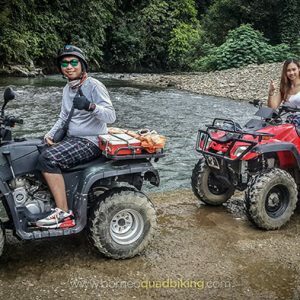 Our quad biking adventure tours travel through paved roads, gravels and muddy terrain with panoramic views of the local villages, paddy fields, mountains, jungles and plantations. 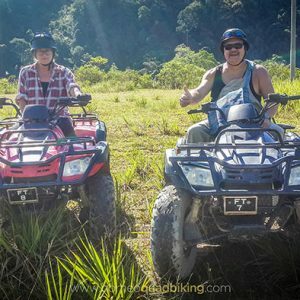 Will there be a guide with us or do we ride on our own? 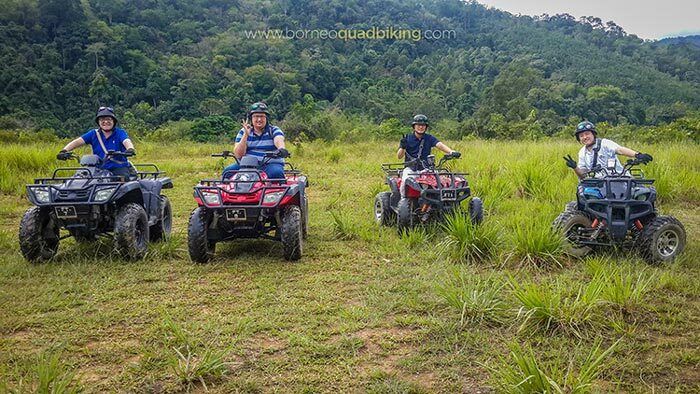 To ensure your safety, you will be accompanied by one guide and sweeper throughout the tour. You will not be riding on your own. Participants who do not show up for their tour will be considered as NO-SHOW. We may be able to reschedule your tour if unforeseen circumstances arise provided that you notify us within 24 hours that you could not make it. This is based on tour availability. NO refund will be provided for no-show. We require all participants to arrive at least 15 minutes before the tour begins. As we run on a timed schedule, it is only appropriate that we start all of our tours on time. We need to be considerate of other participants who may have other activities to do – we do not want them to wait and be late for their next activity! If you are running late, please contact us to let us know. We will try to reschedule your tour to a later time. NO refund will be provided for late arrivals. All participants must wear a helmet at all times. All participants must listen and follow the instructions given by the guide. All participants are required to read and sign the Indemnity Form prior to riding. All participants must travel at a speed that is deemed safe and reasonable throughout the tour and; as is set by the guide, to ensure safety. 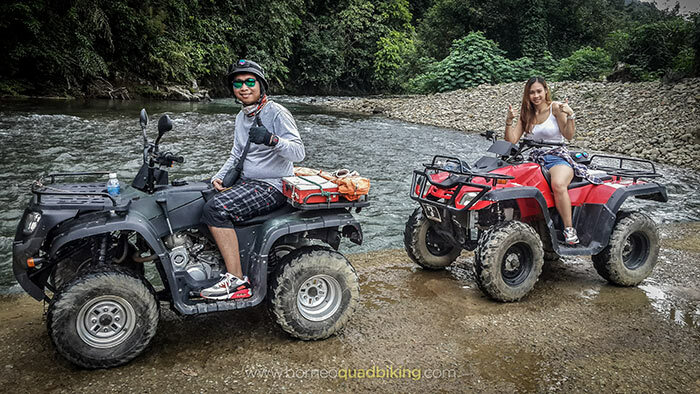 Our quad biking adventure tour is NOT a race but a guided tour. 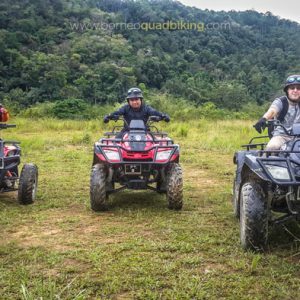 You will be responsible for damage to the quad bike caused by carelessness and recklessness or violations of the rules. All participants must follow the guide in a single tag-a-long file line spaced approximately 3-4 bike lengths apart. 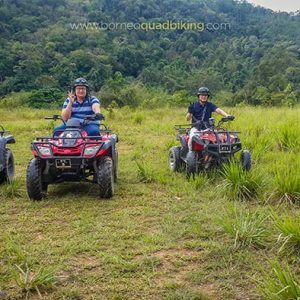 All participants must take responsibility to become aware of the features of the quad bikes prior to riding, including location of brakes, throttle, and ignition switch. The use of drugs or alcohol are strictly PROHIBITED. No riding in unapproved areas; we have designated tracks to follow. No tricks, jumping or tail sliding. We reserve the right to cancel or change tours due to inclement weather, safety reasons, insufficient bookings or events beyond our control. Refunds are not offered but tours may be rescheduled at an alternative date.